Investigate the difference in attractive force between polar and non-polar molecules by “pulling” apart pairs of molecules. While all molecules are attracted to each other, some attractions are stronger than others. Non-polar molecules are attracted through a London dispersion attraction; polar molecules are attracted through both the London dispersion force and the stronger dipole-dipole attraction. The force of attractions between molecules has consequences for their interactions in physical, chemical and biological applications. 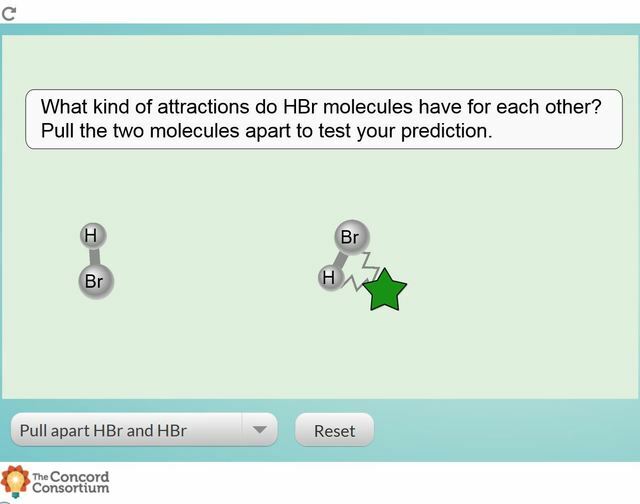 1) Learn about the different attractive forces between various molecules.